God of all wisdom, we offer thanks for John Henry Newman, whose eloquence bore witness that thy Church is one, holy, catholic and apostolic, even amid the changes and cares of this world: Grant that, inspired by his words and example, we may ever follow thy kindly light till we rest in thy bosom, with thy dear Son Jesus Christ and the Holy Spirit; for thou livest and reignest, one God, now and for ever. Amen. God of all wisdom, we offer thanks for John Henry Newman, whose eloquence bore witness that your Church is one, holy, catholic and apostolic, even amid the changes and cares of this world: Grant that, inspired by his words and example, we may ever follow your kindly light till we rest in your bosom, with your dear Son Jesus Christ and the Holy Spirit; for you live and reign, one God, now and for ever. Amen. Thei commemoration adopted provisionally at General Convention 2009. 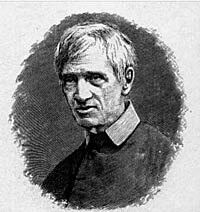 The Venerable John Henry Newman, C.O. (21 February 1801 – 11 August 1890) was a Roman Catholic priest and cardinal, a convert from Anglicanism in October 1845. In his early life, he was a major figure in the Oxford Movement to bring the Church of England back to its Catholic roots. Eventually his studies in history persuaded him to become a Roman Catholic. Both before and after becoming a Roman Catholic, he wrote influential books, including Via Media, Essay on the Development of Christian Doctrine (1845), Apologia Pro Vita Sua (1865–66) and the Grammar of Assent (1870). His happy childhood came to an abrupt end in March 1816 when the financial collapse after the Napoleonic Wars forced his father's bank to close. The period from the beginning of August to 21 December, 1816, when the next term ended, Newman always regarded as the turning point of his life. Alone at school and shocked by the family disaster, he fell ill in August. Later he came to see it as one of the three great providential illnesses of his life, for it was in the autumn of 1816 that he underwent a religious conversion under the influence of one of the schoolmasters, Rev. Walter Mayers, who had himself shortly before been converted to a Calvinistic form of evangelicalism. Newman had had a conventional upbringing in an ordinary Church of England home, where the emphasis was on the Bible rather than dogmas or sacraments, and where any sort of evangelical "enthusiasm" would have been frowned upon. The tone of his mind at this time became evangelical and Calvinist, and he held that the Pope was Antichrist. On Trinity Sunday, 29 May 1825 he was ordained priest in Christ Church Cathedral, Oxford. He became, at the suggestion of Edward Bouverie Pusey, curate of St Clement’s, Oxford. Newman later wrote that the influences leading him in a religiously liberal direction were abruptly checked by his suffering first, at the end of 1827, a kind of nervous collapse brought on by overwork and family financial troubles, and then, at the beginning of 1828, the sudden death of his beloved youngest sister, Mary. There was also a crucial theological factor: his fascination since 1816 with the Fathers of the Church, whose works he began to read systematically in the long vacation of 1828. This he regarded as his second formative providential illness. At this date, though still nominally associated with the Evangelicals, Newman’s views were gradually assuming a higher ecclesiastical tone. On 14 July 1833, John Keble preached at St Mary’s an assize sermon on "National Apostasy," which Newman afterwards regarded as the inauguration of the Oxford Movement. A few weeks later Newman started, apparently on his own initiative, the Tracts for the Times, from which the movement was subsequently named "Tractarian." Its aim was to secure for the Church of England a definite basis of doctrine and discipline. The teaching of the tracts was supplemented by Newman's Sunday afternoon sermons at St Mary's, the influence of which, especially over the junior members of the university, was increasingly marked during a period of eight years. In 1835 Pusey joined the movement, which, so far as concerned ritual observances, was later called "Puseyite". His influence in Oxford was supreme about the year 1839 when, however, his study of the monophysite heresy first raised in his mind a doubt as to whether the Anglican position was really tenable on those principles of ecclesiastical authority which he had accepted. He continued his work, however, as a High Anglican controversialist until he had published, in 1841, Tract 90, the last of the series, in which he put forth, as a kind of proof charge, to test the tenability of all Catholic doctrine within the Church of England, a detailed examination of the Thirty-Nine Articles, suggesting that their negations were not directed against the authorized creed of Roman Catholics, but only against popular errors and exaggerations. In 1842 he withdrew to Littlemore, and was largely devoted to the completion of an Essay on the development of Christian doctrine, by which principle he sought to reconcile himself to the more complex creed and the practical system of the Roman Catholic Church. Newman was formally received into the Roman Catholic Church on 9 October 1845 by Blessed Dominic Barberi, an Italian Passionist, at the College in Littlemore. In October 1846 he proceeded to Rome, where he was ordained priest by Cardinal Giacomo Filippo Fransoni and given the degree of D.D. by Pope Pius IX. Pope Leo XIII was encouraged by the Duke of Norfolk and other distinguished Roman Catholic laymen to make Newman a cardinal. The distinction was a marked one, because he was neither a bishop nor resident in Rome. The offer was made in February 1879. Newman's elevation to cardinal took place on 12 May, making him Cardinal-Deacon of San Giorgio al Velabro. For the Roman Catholic Church in Britain, his conversion secured great prestige and the dissipation of many prejudices. Within it, his influence was mainly in the direction of a broader spirit and of a recognition of the important part played by development both in doctrine and in Church government. The above books and many, many other works by Newman are also online thanks to the National Institute for Newman Studies.